In 2016, researchers at France’s Space Medical Institute posted their offer for a task of a very different kind. They advertised for 24 healthy young men to lie down and do absolutely nothing for two months. The purpose of this experiment was to reproduce microgravity (weightlessness) effect on the human body. This was connected, of course to space travel; with a particular emphasis on how astronauts would respond to re-entry into the earth’s gravitational forces. The stipend for this seemingly cushy job was about $35,000. Not a bad reward for lying down on the job—if you didn’t die from boredom. Professional hockey players are paid to score goals. Wrist shots, slap shots, snap shots, backhanders, tip shots, and flip shots are all used to accomplish this basic intent. Normally this tactic is accomplished while skating in an upright position, in full control of one’s balance—with the puck on one’s stick. But there have been exceptions to that rule. There are a number of instances when pucksters have bulged the twine while lying prone on the ice—or planted firmly on the derriere. Doubtless the most celebrated example of this kind of exploit is recorded for posterity on everyone’s video friend, YouTube. On January 16, 2006, Alexander Ovechkin, the “Great Eight”, pulled off what appeared to be a seemingly impossible score. Skating in from the right boards, he was almost past the Phoenix Coyotes’ Paul Mara, but was dumped on his back. While sliding in that position, virtually out the play, he whipped his stick along the ice, caught the puck on the crook of the blade, and slipped it behind a startled Brian Boucher. Had he been an extra six inches further, the disc would have hit the outside of the cage. He wouldn’t stop there and managed comparable feats later in his career. Against Buffalo, he busted through the defense, was tripped up, and whisked the biscuit behind Patrick Lalime while sliding on his belly. On another occasion, playing against the Canadiens, Montreal’s last line of defense was likewise victimized by his horizontal heroics. On that occasion he was knocked to the playing surface, and while skimming along on his rump, he shovelled the puck past an unsuspecting netminder. One of the earliest instances, when tallying from this unusual stance took place, went into the game’s archives on March 30, 1926. The Montreal Maroons, only in their second season as a member of the NHL brotherhood, had sent the Pittsburgh Pirates and the Ottawa Senators packing in the league’s post-season. It was the final year that the PCHA champions faced off against the best from the East. The Mount Royal city crew hosted the Victoria Cougars in a best-of-five series. Nels Stewart, who led the NHL in scoring during the regular campaign, was dropped back to defense, but still managed to lead the loop in the playoffs as well. On that particular evening, in fact, he lit the lamp twice. His first was the one which was better remembered. Tagged as the outstanding player in the match, early in the game he had baffled the visitor’s rearguards, but ended up sliding on his belly, heading toward the dasher, only 15 feet from the Victoria cage. Just as he arrived adjacent to the net, as he was sliding by, he reached out and poked the puck past a surprised “Hap” Holmes. Doubtless, bulging the twine from a peculiar position took place on a number of occasions over the next several years, but it wasn’t until 1974 that it caught the attention of the press sufficiently to warrant special attention. In fact, it took place twice during that season. 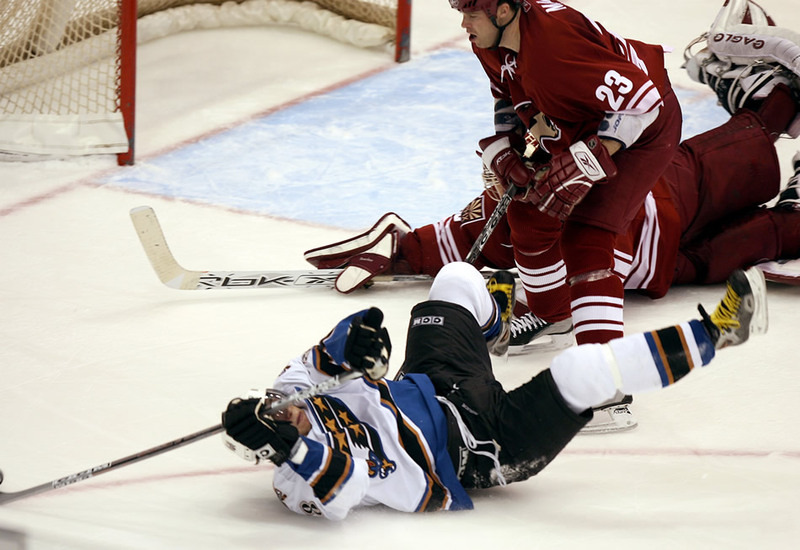 The first fluke feat took place on February 2, when the Buffalo Sabres and the St. Louis Blues locked horns. A most unlikely skater, one Bob Plager, drew special attention at 10:26 of the second frame. Tagged as “200 pounds of humourous turbulence”, he was far more likely to make the headlines for his trips to the sin bin rather than to the points column. But that night he was on his best behaviour. He was sentenced to sit ‘on the fence’ for 48 minutes during the ’73-’74 schedule—a low total for him. But he was not guilty of even one indiscretion during the entire contest. While killing a penalty he received a pass just over his own blue line and headed for the Sabres’ end of the rink. With visions of a short-handed marker dancing in his head he and Buffalo’s backstop, Dave Dryden, crashed in a heap—leaving Bombastic Bob seated on the ice. Nevertheless, the puck bounced over the goal line. It was a bum goal (groan here), but it counted. And, as it happened, it turned out to be the go-ahead tally in a 6-1 victory for the Missouri Six. In December, the Blackhawks and the Red Wings were scoring goals rather freely in their match on the 18th. Cliff Koroll broke the 5-5 tie at 12:39 of the final frame—his second tally of the game. The first had come during the first 20 minutes of play. He flipped the puck past Doug Grant while lying flat on the ice. He had managed to break away at centre, but was held by Gary Bergman. Already slowed down, he was then knocked to the ice by Larry Giroux. However, though lying on his side, he backhanded the old boot heel past Jimmy Rutherford, who had replaced the starting goalie. An entire decade passed by before another instance of lying down on the job caught the attention of the Fifth Estate. On December 23, 1984, the Vancouver Canucks hosted their Western cousins from across the Rockies. With 1.02 remaining in the penalty-filled affair, the Flame’s Colin Patterson was credited with giving the visitors the knot-breaking tally. Carey Wilson’s shot was stopped by goalie John Garrett, but he couldn’t freeze it, and it fell just outside the crease. The Calgary winger was lying flat on his back when the disc crossed the line—but he was the last Flame to touch it. Needless to say the Canucks vehemently protested the marker, arguing that Patterson was in the blue paint—as well as the fact that he interfered with the twine-tender. But the goal stood, and it went into the books as Colin’s 18th of the season. Luc Robitaille was a natural goal scorer. He totalled 668 markers during regular season play over his 19 seasons in the world’s premier hockey league. He retired as the circuit’s highest-scoring left winger in the loop’s history. He could dent the hemp equally well with a wrist shot or a back-hander. On two occasions he caught opposing netminders with their guard down while prostrate on the playing surface. The first surprising score took place against the Calgary Flames in the mid 1980’s. It is featured on his “highlight reel” available on YouTube. Scooting across the ice from the centre lane he attempted to get by defenseman Al MacInnis—no easy task in itself. The big rearguard sent him flying over his stick, resulting in Robitaille landing on is belly, sliding toward the end boards. At the last second he swept his stick at the puck, sending it between Mike Vernon’s pad and the post. If possible, his encore, on February 24, 1999, was even more dramatic—because it was an overtime tally—giving the Kings the victory over the Red Wings. Amidst the frantic action in front of Chris Osgood, Luc fell down. Many would say he then demonstrated how he got to be “Lucky Luc”. Because lying there, within his stick’s length, was the puck. Half on his side, and half on his stomach, he reached out and snagged it in the crook of the top of the blade and swept it, backhanded, past the unsuspecting Motor City goalie. Like Robitaille, Alexander Semin pulled this eye-opening move twice. Interestingly enough, the Carolina Hurricanes were his victims the first time, and were his debtors the second time. On March 3, 2009 he was wearing the colours of the Washington Capitals. With the D.C. troop swarming around Cam Ward’s cage, number 28 circled around Carolina’s defenders, actually heading up the boards toward their blue line. But he lost his footing, and began sliding on his knees. Half turning in the direction of the Cap’s goal, stickhandling like mad, his momentum put him in at a 25-degree angle from his target. He snapped a wrister that fooled the surprised Hurricane cage cop. It was the team’s first tally in the 5-2 loss. On March 8, 2015, now sporting the “third” uniform of those same Hurricanes, he bamboozled Edmonton’s Richard Bachman with his imitation of Robitaille and Ovechkin. The action in front of the Oilers’ net was frantic. Semin fell down, facing away from the desired target. But, lying flat on his stomach, he snagged the disc in the crook of his prone stick’s blade, and swept it along the ice into the cage. This marker turned the game’s tide en route to a 7-4 victory. Strangely enough, just five days previously, Melker Karlsson managed another tummy tuck, while skating for the San Jose Sharks against the Canucks in Vancouver. There were bodies everywhere in front of Markstrom’s goal crease, as a battle for possession raged on. He already had taken a backhander which the hometown netminder had stopped; and was knocked down on his face for his trouble. As luck would have it, while facing away from the net, the rebound practically slid out to him at eye level. He reached out, with his stick lying flat on the playing surface, and slid the disc over the goal line. As usual, this essay does not cover every such scenario of this kind. But there are sufficient examples which affirm the old adage—down does not necessarily mean out!